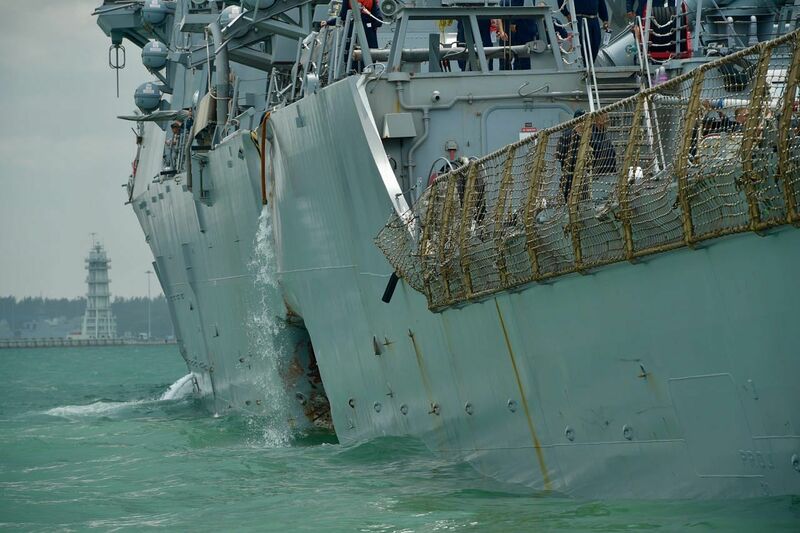 SINGAPORE - A damaged USS John S. McCain has arrived in Singapore after colliding on Monday (Aug 21) morning with a merchant ship, while search and rescue efforts continue for 10 missing sailors in the waters east of Singapore. An amphibious assault ship USS America also arrived at Changi Naval Base and will provide messing and berthing services to McCain crew members and to support damage control efforts on board, the US 7th Fleet said late on Monday. USS America will also support ongoing searches for 10 missing sailors, for whom a search and rescue operation was being carried out north of Pedra Branca in Singapore territorial waters. Ship repair facility divers were on site at Changi Naval Base to assess the damage to the McCain's hull, the 7th Fleet said. It had said earlier there was significant damage to the hull which resulted in flooding to nearby compartments, including crew berthing, machinery, and communications rooms. "Damage control efforts by the crew halted further flooding," it had said in a statement. The collision between the guided-missile destroyer and Alnic MC was reported at 5.24am Singapore time as the US Navy ship was making its way to Singapore for a routine visit. Its home port is Yokosuka in Japan. Apart from the 10 missing sailors, five personnel are injured. Four were medically evacuated by an SAF helicopter to Singapore General Hospital for non-life threatening injuries. The fifth injured US sailor does not require further medical attention. No injuries were reported on the Alnic, said the Maritime and Port Authority of Singapore (MPA). MPA said in a statement earlier that the two ships were on their way to Singapore to assess the damage to their vessels. 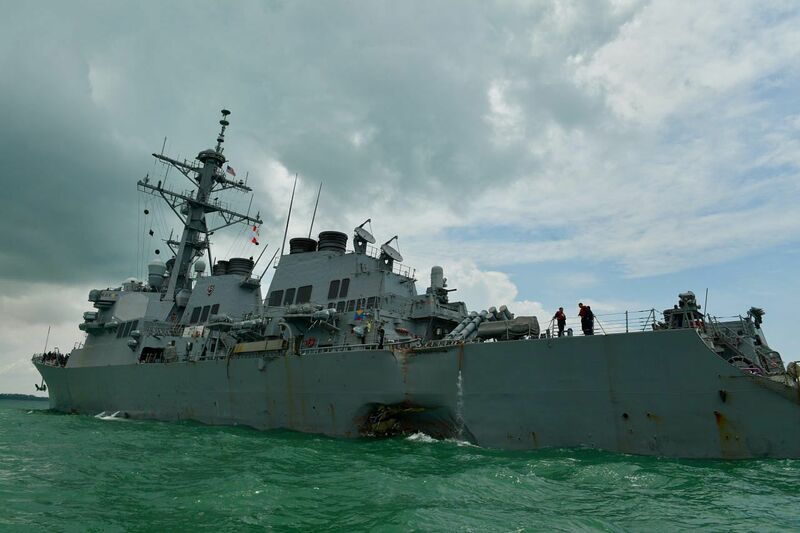 After the collision, the US warship sailed under its own power to Changi Naval Base, according to an update by the US Seventh Fleet on its website. "In addition to tug boats out of Singapore, the Republic of Singapore Navy ship RSS Gallant (97), RSN helicopters and Police Coast Guard vessel Basking Shark (55) are currently in the area to render assistance," said the 7th Fleet. 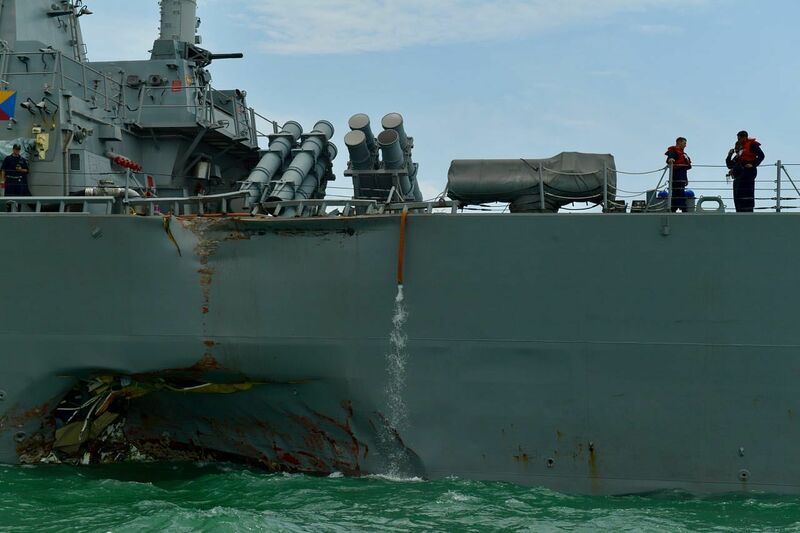 Admiral Scott Swift, the head of the Pacific Fleet, is headed to Singapore to visit the damaged vessel, according to a fleet spokesman cited by Washington Post. The Navy’s 7th Fleet said Navy Seahawk helicopters and Ospreys were mobilised for the search-and-rescue effort, joining tugboats from Singapore, a Singapore police coast guard vessel, and a Singapore navy ship and helicopters. Malaysia and Indonesia have also sent aircraft and vessels to help with the search and rescue. The 7th Fleet set up an emergency assistance centre in Yokosuka for family members of the McCain crew. Families of the ship’s crew members waited through the night in the United States, hoping for news of their loved ones, the New York Times reported. “No word yet but some sailors have called on cell to families,” wrote Marla Meriano, the mother of Meghan Meriano, a 24-year-old electrical officer, in a Facebook post. Alnic MC has been listed on marine websites as a 30,040-tonne, 183m-long Liberian-flagged oil tanker. ​Owned by Greek billionaire and shipping magnate Harry Vafias and his Brave Maritime Corporation company, the ship was en route to Singapore from Pyeongtaek in South Korea. The tanker was carrying nearly 12,000 tonnes of fuel oil, a crew member told Reuters via phone. “We are carrying 11,987 tonnes of fuel oil. There is no oil spill. We were carrying fuel oil from Taiwan to discharge to Singapore... We are proceeding to Raffles Reserved Anchorage where the owners will investigate the matter. There was some damage to the valve,” the crew member who did not want to be identified, told Reuters via telephone. MPA also confirmed that there was no oil spill from the collision. The US Navy said the extent of damage to USS John S McCain and personnel injuries are being determined, and the incident will be investigated. It has set up an emergency family assistance centre at its base in Yokosuka for family members of the ship's personnel. Captain Elizabeth Zimmermann, a spokesman for the US Navy in Japan, said families can gather at the centre and "obtain news and support directly from Navy leaders and ombudsmen". Captain Zimmermann said US Navy ships follow the International Regulations for Preventing Collisions at Sea, or COLREGS, which are published by the International Maritime Organisation. "These regulations are a 'rules of the road' to be followed by ships and other vessels at sea to prevent collisions. This includes guidance on maintaining proper look-outs and conduct of vessels in sight of one another," she told The Straits Times. "We are focused now on finding our missing sailors," she said, adding that the incident will be investigated. The president reportedly offered no further remarks to journalists but took to Twitter Sunday night (US time) to offer his condolences. “Thoughts & prayers are w/ our @USNavy sailors aboard the #USSJohnSMcCain where search & rescue efforts are underway,” Mr Trump wrote. The warship is named after US Senator John McCain's grandfather and father, both admirals in the US Navy. After the accident, Senator McCain tweeted: "Cindy & I are keeping America's sailors aboard the USS John S McCain in our prayers tonight - appreciate the work of search & rescue crews." Former US ambassador to Singapore David Adelman said more than 150 US Navy ships visit Changi Naval Base a year, and Singapore and the US enjoy a strong military to military relationship. “The Straits of Malacca are the most important shipping lanes in the world. At their narrowest they are less than 2 miles (3.2km) wide and thus are perhaps the most congested," he said. The McCain, an Arleigh Burke-class destroyer equipped with Aegis missiles, had been on its way to a routine port visit in Singapore after patrolling in the South China Sea. It recently conducted a freedom-of-navigation operation, sailing within about six nautical miles of Mischief Reef, an artificially built-up land mass in the disputed Spratly Islands. The accident comes two months after seven US sailors died when a US destroyer, USS Fitzgerald, collided with a Philippine-flagged cargo ship off the Japanese coast. The McCain is the fourth US Navy ship to be involved in an accident this year. In January, the USS Antietam ran aground, dumping 1,100 gallons of hydraulic fluid into Tokyo Bay. On May 9, guided-missile cruiser USS Lake Champlain was struck by a South Korean fishing vessel off the Korean Peninsula. The commanding officers of both USS Fitzgerald and USS Antietam were relieved of their duties. Bonji Ohara, a research fellow at the Sasakawa Peace Foundation in Tokyo, told New York Times one recurring problem was that while naval ships tended to have live crews on watch, most commercial ships work on autopilot mode to reduce costs, which can lead to problems in busy sea lanes. The waterways around this region are some of the busiest and most important in the world, carrying around a third of global shipping trade. Ben Stewart, commercial manager of Maritime Asset Security and Training in Singapore, said early indications suggested the warship may have turned across the front of the tanker. “Instances like this should be rare and they are rare,” Stewart was quoted as saying by Reuters. Euan Graham, director of the international security programme at the Lowy Institute in Sydney, called the latest incident “extraordinary” and said it would certainly lead to pointed questions being asked within the Navy. But the incident could also affect the Seventh Fleet and its readiness, Graham was quoted as saying by the Washington Post. “They were already stretched after the Fitzgerald collision and now they’ve lost a second frontline destroyer at an acute time in the region, with the tensions around North Korea and in the South China Sea,” he said. The USS Fitzgerald and USS John S. McCain are sister ships - both ballistic missile defence (BMD) capable ships and part of the same Japan-based destroyer squadron. The Seventh Fleet has six ships assigned to BMD patrols, with half of those out on patrol at any one time, according to a Reuters report. Asked whether the US Navy would need to bring forward other ships to maintain its strength, a spokesman for the Seventh Fleet said it was “way too early to know”. The USS Fitzgerald is still being repaired but is expected to return to service. Shipping data company VesselsValue told The Straits Times that the nine-year-old Alnic MC is currently worth US$17.36 million (S$23.66 million). Brave Maritime has nine vessels - five bunkers, two tankers and 2 LPG vessels - worth a total of US$142.37 million.